Suppose you have three resistors, each of value 30 Ω. List all the different resistances you can obtain using them. A proton beam is moving from east to west. Is there an electric current? If yes, in what direction? Yes, there is an electric current in the direction of the proton beam. Conventionally, the direction of electric current is same as that of the positive charge flow. In an electrolyte, the positive ions move from left to right and the negative ions from right to left. Is there a net current? If yes, in what direction? Yes, there is a net current that flows from left to right. By convention, the direction of current is along the flow of positive charge. As the positive ions move from left to right, current also moves from left to right. Also, since the negative ions move from right to left, current moves from left to right. 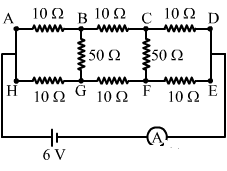 Thus, the movement of net current is from left to right. In a TV tube, electrons are accelerated from the rear to the front. What is the direction of the current? Conventionally, the direction of current is along the direction of flow of positive charge and opposite the direction of flow of negative charge. In a TV tube, current will flow from the front to the rear, as the direction of current is opposite the direction in which electrons are moving. Drift speed is defined as vd = Δl/Δt, where Δl is the distance drifted in a long time Δt. Why don’t we define drift speed as the limit of Δl/Δt as Δt → 0? An electron drifts under the influence of an external electric field. During the course of this motion, an electron follows a very random path. So, we have to take the average for a very long time. Hence, we cannot define drift speed as the limit of Δl/Δt as Δt → 0 because this is a very short interval of time that is not enough to get the desired result. One of your friends says that he has read in the previous chapters that there can be no electric field inside a conductor. Consequently, there can be no current through it. What is the fallacy of this argument? You have studied in the previous chapters that when a static charge is given to a metal, the charge resides on its surface and there is no electric field inside it. But this is not the case when a charge is in motion. Current can flow through a conductor only when an electric field is established inside it. An electric field exists inside the conductor, as it is connected to the battery. Thus, current flows through the conductor. When a current is established in a wire, the free electrons drift in the direction opposite to the current. Does the number of free electrons in the wire continuously decrease? No, the number of electrons in the wire remains constant. The electrons that drift and move to the positive terminal of the battery, under the influence of the external electric field, are replaced by the battery in the circuit. As a result, the total number of free electrons in the wire is always constant. A fan with copper winding in its motor consumes less power compared to a similar fan with aluminium winding. Explain. A copper wire has higher conductance than an aluminium wire. So, a copper wire offer less resistance to the current flow than an aluminium wire. Thus, there is more heat dissipation in an aluminium wire than in a copper wire. This is why a fan with copper winding in its motor consumes less power compared to a similar fan with aluminium winding. The thermal energy developed in a current-carrying resistor is given by U = i2 Rt and also by U = Vit. Should we say that U is proportional to i2 or i? In the expression U = Vit, voltage V and current i are variables for a given time interval. So, based on this expression we cannot say that U is proportional to i. In the expression U = i2Rt, the resistance R is fixed for a circuit for a given time interval. So, based on this expression, we can say that U is proportional to i2 and not i. Consider a circuit containing an ideal battery connected to a resistor. Do “work done by the battery” and “the thermal energy developed” represent two names of the same physical quantity? Yes, the “work done by the battery” and “the thermal energy developed” represent two names of the same physical quantity. The work done by the battery on the resistor is dissipated by the resistor in the form of thermal energy. Hence the ” work done by the battery ” and ” the thermal energy developed ” represent two names of the same physical quantity. However, a non-ideal battery, in this case, would have to do extra work in order to overcome the internal resistance of the battery. Hence, the work done by a non-ideal battery will not be equal to the thermal energy developed. Is work done by a battery always equal to the thermal energy developed in electrical circuit? What happens if a capacitor is connected in the circuit? 12 C V2 of energy is lost in the form of heat and electromagnetic radiation. A non-ideal battery is connected to a resistor. Is work done by the battery equal to the thermal energy developed in the resistor? Will your answer change if the battery is ideal? No, the work done by a non-ideal battery is not equal to the thermal energy developed in the resistor, as energy is spent to overcome the internal resistance of the battery and the resistance of the wire that connects the circuit elements/resistor to the battery. However, the resistance of the wire is generally negligible. Yes, the answer will change if the battery is ideal. An ideal battery has no internal resistance. Hence, the work done by an ideal battery will be equal to the thermal energy developed in the resistor, assuming that the resistance of the wires used for connection is negligible. Sometimes it is said that “heat is developed” in a resistance when there is an electric current in it. Recall that heat is defined as the energy being transferred due to temperature difference. Is the statement in quotes technically correct? Yes, the given statement is correct. When charge flows through a conductor, its electric potential energy decreases. This loss in electric potential energy appears as increased heat energy of the resistor. Thus, heat energy is developed in a resistor when there is an electric current in it. We often say, “A current is going through the wire.” What goes through the wire, the charge or the current? When there is a transfer of charge through a wire, current is said to be flowing through it. It is the electron/charge that drifts through the wire. The assertions “charge is going” and “current is going through the wire” are correct, as they signify the same thing, that is, flow of charge. Would you prefer a voltmeter or a potentiometer to measure the emf of a battery? A potentiometer is preferred to measure the emf of a battery, as it gives a more accurate result. This is because a potentiometer uses the null method to measure emf and it hardly draws any current from the primary circuit. When a voltmeter is used in the circuit, its equivalent resistance is connected parallel to some element of the circuit. This changes the overall current in the circuit and, hence, the potential difference to be measured also changes. The error can be minimised if the equivalent resistance of the voltmeter is increased. However, we also need to keep in mind the heat dissipated due to high resistance while deciding the value of resistance of the voltmeter. Hence a potentiometer is preferred. Does a conductor become charged when a current is passed through it? No, a conductor does not become charged when a current is passed through it. The free electrons present in the valence shell in a circuit drift from a lower potential to a higher potential and, thus, current is produced. A battery does not provide any extra electrons or charge to the circuit. It just provides a potential difference across two points, which helps in creating an electric field. This further helps in moving the electrons along the conductor. Can the potential difference across a battery be greater than its emf? The potential difference across a battery cannot be greater than its emf. Basically, emf is the maximum potential difference between the terminals of a battery when the terminals are not connected externally to an electric circuit. When the same battery is connected to an electric circuit, current flows in the closed circuit. When current flows, the potential difference across the terminals of the battery is decreased as some potential drop due to its internal resistance. Due to the internal resistance in the battery, the potential difference across it is less than its emf. However, for an ideal battery, potential difference and emf are equal. If the number of collisions of the free electrons with the lattice is decreased, then the drift velocity of the electrons increases. i = neAVd , where ‘n‘ is the number density of electrons and ‘A’ is the area of the cross-section of the conductor. So, we can easily see that current increases with increase in drift velocity. Two resistors A and B have resistances RA and RB, respectively, and RA < RB. The resistivities of their materials are ρA and ρB. (d) The information is not sufficient to find the relation between ρA and ρB. R=ρlAFrom the given comparison of resistances, we cannot derive the correct relation between the resistances. We also need to know the cross-sectional areas and the lengths of both the conductors before concluding about their resistivities. Only then can the relation between the resistivities be found. The information is not sufficient to find the relation between ρA and ρB. ρ=1σ⇒ρ×σ=1The product of conductivity and resistivity is unity. So, this product does not depend on any of the given quantities. The product of resistivity and conductivity is independent of temperature. As the temperature of a metallic resistor is increased, the resistivity increases and conductivity decreases. Hence, both the conductivity and resistivity of the metallic resistor nullify the effect of the change in temperature. In the study of electric current, the direction opposite the flow of electrons is regarded as the direction of flow of positive charge. In a battery, positive charge flows from the negative terminal to the positive terminal when it is discharging (connected to external circuit). But when the battery is charged, the positive charge flows from the positive terminal to the negative terminal. As the resistance is connected to an ideal battery, it provides a constant potential difference across the two terminals. The internal resistance of the battery is also zero. ∝1RThus, if the value of the resistance is decreased, the power dissipated in the resistor will increase. A current passes through a resistor. Let K1 and K2 represent the average kinetic energy of the conduction electrons and the metal ions, respectively. The metal ions are bound at their positions and vibrate due to collisions with electrons and due to thermal energy. The conduction electrons are free to move. They get energy from the electric field set inside the conductor by connection with a battery and due to thermal motion. The velocity of the electrons is high. Thus, the kinetic energy of the electrons is greater than the kinetic energy of the metal ions. where i is the current flowing through the resistor of resistance R for time t. Since the resistors are connected in series, the current flowing through both the resistors is same and the time for which the current flows is also same. Thus, the ratio of the thermal energy developed in R and 2 R is 1 : 2. V22RtThus, Heat developed in the resistance R and 2R are in ratio 2:1. Resistance of a wire is directly proportional to its length. So, when we cut the wire into 5 equal parts, the resistance of each part will be 10 Ω. (A) Kirchhoff’s junction law follows from conservation of charge. (B) Kirchhoff’s loop law follows from conservative nature of electric field. (a) A and B are correct. (d) A and B are wrong. According to Kirchhoff’s junction law, the net charge coming towards a point should be equal to the net charge going away from that point in the same time. It follows from the principle of conservation of charge. The loop law follows from the fact that electrostatic force is a conservative force and the work done by it in any closed path is zero. (A) The equivalent emf is larger than either of the two emfs. (B) The equivalent internal resistance is smaller than either of the two internal resistances. Let the emfs of the batteries be e1 and e2, and their respective resistances be r1 and r2. Since the batteries are connected in series, the equivalent emf will be the sum of the emf of the two batteries ( e = e1 + e2) . Thus, the equivalent emf is larger than either of the two emfs. Hence, statement A is correct. Since the batteries are connected in series, the equivalent internal resistance (r) of the combination will be the sum of the internal resistance of the two batteries ( r = r1 + r2). Thus, the equivalent internal resistance is greater that either of the two resistances. Hence, statement B is wrong. (A) The equivalent emf is smaller than either of the two emfs. ε0=ε1r1+ε2r2r1+r2Thus, the equivalent emf is greater than either of the emfs. Thus, statement A is wrong. r=r1r2r1+r2Thus, the value of the resultant resistance is even smaller than either resistance. The ammeter is connected in series with the circuit to measure the net amount of current flowing through the circuit. If the net resistance of the ammeter is high, then the amount of current that the circuit draws will have error. Hence, we cannot accurately measure the amount of current that the circuit draws from the voltage source. Hence, the net resistance or the equivalent resistance of an ammeter should be small enough to ensure that it does not appreciably change the current to be measured. To measure potential difference across any circuit element, the voltmeter is connected in parallel to that circuit element. Let Req be the equivalent resistance of the voltmeter and V be the potential difference across the voltmeter. VReqHence, the deflection in the voltmeter is proportional to the current i and, hence, proportional to V. However, when the voltmeter is used in a circuit, its resistance Req is connected in parallel to some circuit element. This might change the overall resistance of the circuit and, hence, the current. Consequently, the potential difference to be measured is also changed. To minimise the error due to this, the equivalent resistance Req of the voltmeter should be large. When a large resistance is connected in parallel to a small resistance, the equivalent resistance is only slightly less than the smaller one. Consider a capacitor-charging circuit. Let Q1 be the charge given to the capacitor in a time interval of 10 ms and Q2 be the charge given in the next time interval of 10 ms. Let 10 μC charge be deposited in time interval t1 and another 10 μC charge be deposited in the next time interval t2. 10 μC charge be deposited in a time interval t1 and the next 10 μC charge is deposited in the next time interval t2. Electrons are emitted by a hot filament and are accelerated by an electric field, as shown in the figure (32-Q1). The two stops at the left ensure that the electron beam has a uniform cross-section. (a) The speed of the electrons is more at B than at A. (b) The electric current is from left to right. (c) The magnitude of the current is larger at B than at A. (d) The current density is more at B than at A. Let the potentials at A and B be VA and VB. potential increases in the direction opposite to the direction of the electric field. Let the kinetic energy of an electron at points A and B be KA and KB respectively. Therefore, the speed of the electrons is more at B than at A. A capacitor with no dielectric is connected to a battery at t = 0. Consider a point A in the connecting wires and a point B between the plates. (a) There is no current through A. (b) There is no current through B. (c) There is a current through A as long as the charging is not complete. (d) There is a current through B as long as the charging is not complete. As the capacitor is connected to the battery at t = 0, current flows through the wire up to the time the capacitor is charged. As the capacitor is completely charged, the potential difference across the capacitor is equal to the terminal potential of the battery. So, the current stops flowing and does not pass through the point between the plates of the capacitor, as there is no medium for the flow of charge. When no current is passed through a conductor, it means that there is no net charge transfer through it. The free electrons are in random motion. The net charge transfer through the cross-section of the conductor is zero. As there is no net charge transfer at any instant, it means that the average of the velocities of all the free electrons at an instant is zero. If we see the motion of each electron as its motion is random and there is no net transfer of charge. Thus, it can be concluded that the average velocity of a free electron over a large period of time is zero. Which of the following quantities does not change when a resistor connected to a battery is heated due to the current? As the resistor connected to the battery is heated, the thermal energy of the electrons increases. Thus, the relaxation time of the electrons will decrease and so will the drift velocity. Resistivity is inversely proportional to the relaxation time; thus, resistivity will increase with decrease in relaxation time. Therefore, resistance will also change. The number of electrons in a resistor will remain same. ρσ=ρ1/ρ=ρ2As resistivity increases with temperature, the square of resistivity will also increase. Hence, the ratio of resistivity and conductivity will increase with increase in temperature. A current passes through a wire of non-uniform cross-section. Which of the following quantities are independent of the cross-section? Drift speed and current density are inversely proportional to the area of cross-section of a wire. Thus, they are dependent on the cross-section. The charge crossing in a given time interval is independent of the area of cross-section of the wire. Free electron density is the total number of free electrons per unit volume of the wire. The density of free electrons depends on the distribution of the free electrons throughout the volume of the wire. It does not depend on the cross-section of the wire. (a) An ammeter should have small resistance. (b) An ammeter should have large resistance. (c) A voltmeter should have small resistance. (d) A voltmeter should have large resistance. The ammeter is connected in series in the circuit whose current is to be measured. If the net resistance of the ammeter is high, then the amount of current that the circuit draws will have error . So, we won’t be able to accurately measure the amount of current that the circuit draws from the voltage source. Thus, it should have a small resistance. To measure the potential difference across any circuit element, the voltmeter is connected in parallel to that circuit element. If the resistance of the voltmeter is large, then maximum voltage drop occurs across the voltmeter and it will measure the correct value of the potential. 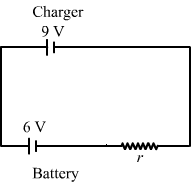 A capacitor of capacitance 500 μF is connected to a battery through a 10 kΩ resistor. The charge stored in the capacitor in the first 5 s is larger than the charge stored in the next. Thus, the charge developed on the capacitor in the first 5 seconds is greater than the charge developed in the next 5,50, 500 seconds. Disclaimer : Out of the four given options, two options are same. A capacitor C1 of capacitance 1 μF and a capacitor C2 of capacitance 2 μF are separately charged by a common battery for a long time. The two capacitors are then separately discharged through equal resistors. Both the discharge circuits are connected at t = 0. (a) The current in each of the two discharging circuits is zero at t = 0. (b) The currents in the two discharging circuits at t = 0 are equal but not zero. 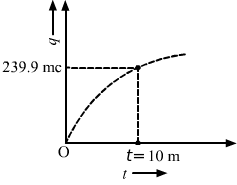 (c) The currents in the two discharging circuits at t = 0 are unequal. (d) C1 loses 50% of its initial charge sooner than C2 loses 50% of its initial charge. Let the voltage of the battery connected to the capacitors be V. Both the capacitors will charge up to the same potential (V). Let the time taken by the capacitor C1 to lose 50% of the charge be t1. Thus, we can say that C1 loses 50% of its initial charge sooner than C2 loses 50% of its initial charge. Q(t) = At2 + Bt + C.
(a) Write the dimensional formulae for A, B and C.
(b) If the numerical values of A, B and C are 5, 3 and 1, respectively, in S.I units, find the value of the current at t = 5 s.
We can only add the terms with the same dimensions. So, all the individual terms will have dimensions equal to the dimensions of the charge. An electron gun emits 2.0 ×1016 electrons per second. What electric current does this correspond to? The electric current existing in a discharge tube is 2.0 μA. How much charge is transferred across a cross-section of the tube in 5 minutes? Let Q amount of charge be transferred across the cross-section of the tube. where i0 = 10 A and α = 4 As–1. Find the charge that crosses through a section of the wire in 10 seconds. A current of 1.0 A exists in a copper wire of cross-section 1.0 mm2. Assuming one free electron per atom, calculate the drift speed of the free electrons in the wire. The density of copper is 9000 kg m–3. where NA is known as Avagadro’s number and is equal to 6 × 1023 atoms. A wire of length 1 m and radius 0.1 mm has a resistance of 100 Ω. Find the resistivity of the material. Let ρ be the resistivity of the wire. A uniform wire of resistance 100 Ω is melted and recast as a wire whose length is double that of the original. What would be the resistance of the wire? Consider a wire of length 4 m and cross-sectional area 1 mm2 carrying a current of 2 A. If each cubic metre of the material contains 1029 free electrons, find the average time taken by an electron to cross the length of the wire. i=nAVde⇒Vd=inAe=21029×10-6×1.6×10-19⇒Vd=18000 m/s,where Vd is the drift speed. Let t be the time taken by an electron to cross the length of the wire. Let l be the required length of the copper wire. Figure (32.E1) shows a conductor of length l with a circular cross-section. The radius of the cross-section varies linearly from a to b. The resistivity of the material is ρ. Assuming that b – a << l, find the resistance of the conductor. Let us consider a small element strip of length dx at a distance x from one end, as shown below. Let the resistance of the small element strip be dR. Let the radius at that point be c .
A copper wire of radius 0.1 mm and resistance kΩ is connected across a power supply of 20 V. (a) How many electrons are transferred per second between the supply and the wire at one end? (b) Write down the current density in the wire. (a) Let q be the charge transferred per second and n be the number of electrons transferred per second. Calculate the electric field in a copper wire of cross-sectional area 2.0 mm2 carrying a current of 1 A. A wire has a length of 2.0 m and a resistance of 5.0 Ω. Find the electric field existing inside the wire if it carries a current of 10 A. The resistance of an iron wire and a copper wire at 20°C are 3.9 Ω and 4.1 Ω, respectively. At what temperature will the resistance be equal? Temperature coefficient of resistivity for iron is 5.0 × 10–3 K–1 and for copper, it is 4.0 × 10–3 K–1. Neglect any thermal expansion. The current in a conductor and the potential difference across its ends are measured by an ammeter and a voltmeter. The meters draw negligible currents. The ammeter is accurate but the voltmeter has a zero error (that is, it does not read zero when no potential difference is applied). Calculate the zero error if the readings for two different conditions are 1.75 A, 14.4 V and 2.75 A, 22.4 V.
Let the magnitude of zero error in the voltmeter reading be V.
We need to subtract the zero error from the readings obtained under the two given conditions to obtain the true value of potential difference. Under both the conditions ,the resistance of the wire will not change. I1RI2R=V1V2⇒1.752.75=14.4-V22.4-V⇒0.350.55=14.4-V22.4-V⇒711=14.4-V22.4-V⇒7×22.4-V=1114.4-V⇒156.8-7V=158.4-11V⇒7-11V=156.8-158.4⇒-4V=-1.6⇒V=0.4 VMagnitude of zero error, V = 0.4 V, which can either be positive or negative. Positive or negative zero error just indicates that the needle of the voltmeter is to the right or left of the zero marked on the device if zero voltage is applied across the voltmeter. Figure (32-E2) shows an arrangement to measure the emf ε and internal resistance r of a battery. The voltmeter has a very high resistance and the ammeter also has some resistance. The voltmeter reads 1.52 V when the switch S is open. When the switch is closed, the voltmeter reading drops to 1.45 V and the ammeter reads 1.0 A. Find the emf and the internal resistance of the battery. When the switch S is opened, loop 2 will be open and no current will pass through the ammeter. Loop 1 will be closed; so, a current will flow through it. But since the voltmeter has very high resistance, compared to the internal resistance of the battery, the voltage-drop across the internal resistance can be ignored, compared to the voltage drop across the voltmeter. So, the voltage appearing across the voltmeter will be almost equal to the emf of the battery. 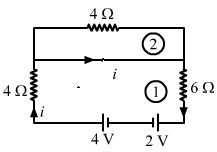 (b) When the switch is closed, current will pass through the circuit in loop 2. In this case, there will be a voltage drop across r due to current i flowing through it. The potential difference between the terminals of a battery of emf 6.0 V and internal resistance 1 Ω drops to 5.8 V when connected across an external resistor. Find the resistance of the external resistor. Let R be the resistance of the external resistor. The potential difference between the terminals of a 6.0 V battery is 7.2 V when it is being charged by a current of 2.0 A. What is the internal resistance of the battery? As the battery is getting charged, the voltage drop across the terminals of the battery will be equal to the emf of the battery plus the voltage drop across the internal resistance of the battery. The internal resistance of an accumulator battery of emf 6 V is 10 Ω when it is fully discharged. As the battery gets charged up, its internal resistance decreases to 1 Ω. The battery in its completely discharged state is connected to a charger that maintains a constant potential difference of 9 V. Find the current through the battery (a) just after the connections are made and (b) after a long time when it is completely charged. Find the value of i1/i2 in the figure (32-E3) if (a) R = 0.1 Ω (b) R = 1 Ω and (c) R = 10 Ω. Note from your answers that in order to get more current from a combination of two batteries, they should be joined in parallel if the external resistance is small and in series if the external resistance is large, compared to the internal resistance. 0.1i1+1i1-6+1i1-6=0⇒0.1i1+1i1+1i1=12⇒i1=122.1=5.71 ANow, consider the given circuit. Consider N = n1n2 identical cells, each of emf ε and internal resistance r. Suppose n1 cells are joined in series to form a line and n2 such lines are connected in parallel. The combination drives a current in an external resistance R. (a) Find the current in the external resistance. (b) Assuming that n1 and n2 can be continuously varied, find the relation between n1, n2, R and r for which the current in R is maximum. Total emf of one row will be equal to the net emf across all the n2 rows because of parallel connection. n1r=n2R n1r=n2R∴ I is maximum when n1r = n2R . A battery of emf 100 V and a resistor of resistance 10 kΩ are joined in series. This system is used as a source to supply current to an external resistance R. If R is not greater than 100 Ω, the current through it is constant up to two significant digits. Find its value. This is the basic principle of a constant-current source. i=10010000+100 =10010100=0.009900 AWe can see that up to R = 100 Ω, the current does not change up to two significant digits. If the reading of the ammeter, A1 in the figure (32-E4) is 2.4 A, what will be the readings of ammeters A2 and A3? Neglect the resistances of the ammeters. Since the 20 Ω and 30 Ω resistors are connected in parallel, the voltage across them will be the same. minimum and maximum currents through the ammeter as the rheostat is varied. Current will be minimum when the rheostat will have maximum resistance, i.e 30 Ω.
imin=5.536.67=0.15 ACurrent will be maximum when the rheostat will have minimum resistance, i.e. 0 Ω. Three bulbs, each with a resistance of 180 Ω, are connected in parallel to an ideal battery of emf 60 V.
Find the current delivered by the battery when (a) all the bulbs are switched on, (b) two of the bulbs are switched on and (c) only one bulb is switched on. (a) When all the bulbs are switched on, we have a combination of three bulbs in parallel. i=6060=1 A(b) When two of the bulbs are switched on, they are parallel to each other. Suppose you have three resistors of 20 Ω, 50 Ω and 100 Ω. What minimum and maximum resistance can you obtain from these resistors? We can obtain maximum resistance when all the resistors are connected in series. A bulb is made using two filaments. A switch selects whether the filaments are used individually or in parallel. When used with a 15 V battery, the bulb can be operated at 5 W, 10 W or 15 W. What should be the resistances of the filaments? where R is the resistance, V is the voltage drop and P is the power on which the bulb is operated. We can calculate the resistance of the bulb for the same V and different P.
R1=1525=45 ΩR2=15210=22.5 ΩR3=15215=15 ΩWhen the two resistance are used in parallel, the equivalent resistance will be less than their individual resistance. ∴ The two resistance are 45 Ω and 22.5 Ω. Figure (32-E6) shows a part of a circuit. If a current of 12 mA exists in the 5 kΩ resistor, find the currents in the other three resistors. What is the potential difference between the points A and B? Let the current flowing through the resistors be marked as shown in the figure. The resistors of 20 kΩ and 10 kΩ are connected in parallel. So, the potential difference across their ends will be same, i.e. An ideal battery sends a current of 5 A in a resistor. When another resistor of 10 Ω is connected in parallel, the current through the battery is increased to 6 A. Find the resistance of the first resistor. Let the resistance of the first resistor be R.
i=5=VRNow, the other resistor of 10 Ω is connected in parallel with R.
Find the equivalent resistance of the network shown in the figure (32-E7) between the points a and b. The simplified circuit can be drawn as shown below. A wire of resistance 15.0 Ω is bent to form a regular hexagon ABCDEFA. Find the equivalent resistance of the loop between the points (a) A and B (b) A and C and (c) A and D.
From the figure, it can be seen that between points A and B, the resistance of the first side of the hexagon will be in parallel with the total resistance of the other five sides. The resistance of the first side can be calculated as shown below. Reff=15×56×15615×56+156=15×5×156×675+156 =15×5×156×90=2512 =2.08 Ω(b) From the figure, it can be seen that between points A and C, the resistance of the first two sides of the hexagon will be in parallel with the total resistance of the other four sides. Reff=15×46×15×2615×46+15×26=15×4×2×156×660+306 =15×2×4×156×90 =103=3.33 Ω(c) From the figure, it can be seen that between points A and D, the resistance of the first three sides of the hexagon will be in parallel with the total resistance of the other three sides. Consider the circuit shown in the figure (32-E8). Find the current through the 10 Ω resistor when the switch S is (a) open (b) closed. Find the currents through the three resistors shown in the figure (32-E9). From the figure, we can see that current will flow only in loop 1 because current follows the least resistive path. All the current will pass through the wire connected in parallel to the 4 Ω resistor in loop 2. ∴ There will be no current through the 4 Ω resistor in loop 2. Figure (32-E10) shows a part of an electric circuit. The potentials at the points a, b and c are 30 V, 12 V and 2 V respectively. Find the currents through the three resistors. Let the potential at the point o be X volts. Each of the resistors shown in the figure (32-E11) has a resistance of 10 Ω and each of the batteries has an emf of 10 V. Find the currents flowing through the resistors a and b in the two circuits. Potential difference between the two ends of resistor a = 10 V.
Find the potential difference Va – Vb in the circuits shown in the figure (32-E12). We can see that it is similar to the circuit in figure a and, hence, the answer obtained will be same. In the circuit shown in the figure (32-E13), ε1 = 3 V, ε2 = 2 V, εa = 1 V and r1 = r2 = r3 = 1Ω. Find the potential difference between the points A and B and the current through each branch. Find the current through the 10 Ω resistor shown in the figure (32-E14). Find the circuit in the three resistors shown in the figure (32-E15). What should be the value of R in the figure (32-E16) for which the current in it is zero? For current to be zero in the middle branch, the circuit should be balanced. According to the Wheatstone bridge principle, balancing a circuit does not depend on the value of resistance R in the middle branch. The circuit in this case is balanced. Hence, any value of R is acceptable. Find the equivalent resistance of the circuits shown in the figure (32-E17) between the points a and b. Each resistor has resistance r.
(a) The simplified circuit can be drawn as shown below. Here cdeo forms a balanced Wheatstone bridge; therefore, branch od will become become ineffective. The simplified circuit will then be as shown below. Let Reff be the effective resistance of the circuit.Then, from the symmetry of the circuit, we can assume that the current moving along CO enters OB and the current moving along EO enters OD. So, the circuit can be simplified as shown below. Find the current measured by the ammeter in the circuit shown in the figure (32-E18). From the symmetry of the circuit,we can see that the potential at point C will be equal to the potential at point F. This implies that no current will flow in this branch. Hence, this arm of the circuit can be removed. Similarly, the potential at point B will be equal to the potential at point G. So, this arm of the circuit can also be removed. The simplified circuit diagram will be as shown below. i=615=0.4 ASo, the ammeter reading will be 0.4 A. Consider the circuit shown in the figure (32-E19a). 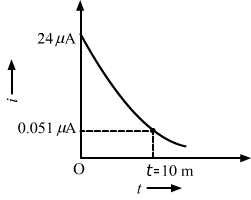 Find (a) the current in the circuit (b) the potential drop across the 5 Ω resistor (c) the potential drop across the 10 Ω resistor (d) Answer the parts (a), (b) and (c) with reference to the figure (32-E19b). 10i+6+5i+12=0⇒10i+5i=-18⇒15i=-18⇒i=-1815=-65=-1.2 AThe negative sign indicates that current is flowing in the direction opposite to our assumed direction. Twelve wires, each of equal resistance r, are joined to form a cube, as shown in the figure (32-E20). Find the equivalent resistance between the diagonally-opposite points a and f.
Let V be the potential difference between the points a and f. Let current i enter a and leave from f. The distribution of current in various branches is shown in figure. Find the equivalent resistances of the networks shown in the figure (32-E21) between the points a and b. (a) The circuit can be simplified stepwise, as shown below. Reff=5r3×r5r3+r=5r8(b) The circuit can be simplified, as shown below. Reff=2r×2r2r+2r=r(d) The circuit can be simplified as shown below. Reff=r4(e) The circuit can be redrawn as shown below. Now, we can see that the circuit is a balanced Wheatstone bridge. So, the branch xy will become ineffective. Thus, the simplified circuit will become as shown below. An infinite ladder is constructed with 1 Ω and 2 Ω resistors, as shown in the figure (32-E22). (a) Find the effective resistance between the points A and B. (b) Find the current that passes through the 2 Ω resistor nearest to the battery. (a) Let the effective resistance of the combination be R. The circuit can be redrawn as shown below. The emf ε and the internal resistance r of the battery, shown in the figure (32-E23), are 4.3 V and 1.0 Ω respectively. The external resistance R is 50 Ω. The resistances of the ammeter and voltmeter are 2.0 Ω and 200 Ω respectively. (a) Find the readings of the two 200 Ω respectively. (a) Find the readings of the two meters. (b) The switch is thrown to the other side. What will be the readings of the two meters now? i=4.342.27=0.1 AIn this case, the ammeter will read the current flowing through the 50 Ω resistance, which is i1, as shown. The currents in the two parallel branches will distribute in the inverse ratio of the resistances. A voltmeter of resistance 400 Ω is used to measure the potential difference across the 100 Ω resistor in the circuit shown in the figure (32-E24). (a) What will be the reading of the voltmeter? (b) What was the potential difference across 100 Ω before the voltmeter was connected? i=84280=0.3 ASince 100 Ω resistor and 400 Ω resistor are connected in parallel, the potential difference will be same across their ends. Let the current through 100 Ω resistor be i1 ; then, the current through 400 Ω resistor will be i – i1. (b) Before the voltmeter is connected, the two resistors 100 Ω resistor and 200 Ω resistor are in series. The voltmeter shown in the figure (32-E25) reads 18 V across the 50 Ω resistor. Find the resistance of the voltmeter. A voltmeter consists of a 25 Ω coil connected in series with a 575 Ω resistor. The coil takes 10 mA for full-scale deflection. What maximum potential difference can be measured by this voltmeter? It is given that for maximum current, i = 10 mA, the potential drop across the voltmeter will be maximum. An ammeter is to be constructed that can read currents up to 2.0 A. If the coil has resistance of 25 Ω and takes 1 mA for full-scale deflection, what should be the resistance of the shunt used? Let R be the resistance of the shunt used. A voltmeter coil has resistance 50.0 Ω and a resistor of 1.15 kΩ is connected in series. It can read potential differences up to 12 volts. If this same coil is used to construct an ammeter that can measure currents up to 2.0 A, what should be the resistance of the shunt used? ig=121200 A=0.01 ALet R be the resistance of the shunt used for ammeter. The potentiometer wire AB shown in the figure (32-E26) is 40 cm long. Where should the free end of the galvanometer be connected on AB, so that the galvanometer may show zero deflection? RADRDB=lADlDB=812=23 ⇒lAD=23lDBlAD+lDB=40 cm⇒lDB23+lDB=40 cm⇒53lDB=40 cm⇒lDB=40×35=24 cmHence, the null-point is obtained 24 cm from B. The potentiometer wire AB shown in the figure (32−E27) is 50 cm long. When AD = 30 cm, no deflection occurs in the galvanometer. Find R.
A 6-volt battery of negligible internal resistance is connected across a uniform wire AB of length 100 cm. The positive terminal of another battery of emf 4 V and internal resistance 1 Ω is joined to the point A, as shown in the figure (32-E28). Take the potential at B to be zero. (a) What are the potentials at the points A and C? (b) At which point D of the wire AB, the potential is equal to the potential at C? (c) If the points C and D are connected by a wire, what will be the current through it? (d) If the 4 V battery is replaced by a 7.5 V battery, what would be the answers of parts (a) and (b)? VADVBD=lADlDB⇒42=lAD100-lAD⇒4100-lAD=2lAD⇒6lAD=400⇒lAD=4006=66.7 cm(c) When the points C and D are connected by a wire, current flowing through the wire will be zero because the points are at the same potential. Since the potential at C is negative now, this point will go beyond point B, which is at 0 V. Hence, no such point D will exist between the points A and B. Consider the potentiometer circuit as arranged in the figure (32−E29). The potentiometer wire is 600 cm long. (a) At what distance from the point A should the jockey touch the wire to get zero deflection in the galvanometer? (b) If the jockey touches the wire at a distance of 560 cm from A, what will be the current in the galvanometer? Let X be the null point on the wire at a distance x cm from point A, as shown. Find the charge on the capacitor shown in the figure (32-E30). In steady state, the capacitor is fully charged and then, it offers infinite resistance to the direct current flow. So, no current can flow through the capacitor in steady state. (a) Find the current in the 20 Ω resistor shown in the figure (32-E31). (b) If a capacitor of capacitance 4 μF is joined between the points A and B, what would be the electrostatic energy stored in it in steady state? Find the charges on the four capacitors of capacitances 1 μF, 2 μF, 3 μF and 4 μF shown in the figure (32-E32). i=62=3 ACurrent i is divided in the inverse ratio of the resistance in each branch. One branch has resistance of 3 Ω and the other branch has resistance of 6 Ω. Find the potential difference between the points A and B and between the points B and C of the figure (32−E33) in steady state. 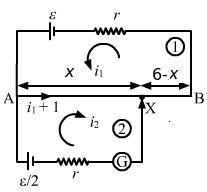 Ceq between A and B is 6 μf. A capacitance C, a resistance R and an emf ε are connected in series at t = 0. What is the maximum value of (a) the potential difference across the resistor (b) the current in the circuit (c) the potential difference across the capacitor (d) the energy stored in the capacitor (e) the power delivered by the battery and (f) the power converted into heat? (a) When the charge on the capacitor is zero, it acts as short circuit. A parallel-plate capacitor with plate area 20 cm2 and plate separation 1.0 mm is connected to a battery. The resistance of the circuit is 10 kΩ. Find the time constant of the circuit. A capacitor of capacitance 10 μF is connected to a battery of emf 2 V. It is found that it takes 50 ms for the charge of the capacitor to become 12.6 μC. Find the resistance of the circuit. A 20 μF capacitor is joined to a battery of emf 6.0 V through a resistance of 100 Ω. Find the charge on the capacitor 2.0 ms after the connections are made. The plates of a capacitor of capacitance 10 μF, charged to 60 μC, are joined together by a wire of resistance 10 Ω at t = 0. Find the charge on the capacitor in the circuit at (a) t = 0 (b) t = 30 μs (c) t = 120 μs and (d) t = 1.0 ms.
A capacitor of capacitance 8.0 μF is connected to a battery of emf 6.0 V through a resistance of 24 Ω. Find the current in the circuit (a) just after the connections are made and (b) one time constant after the connections are made. A parallel-plate capacitor of plate area 40 cm2 and separation between the plates 0.10 mm, is connected to a battery of emf 2.0 V through a 16 Ω resistor. Find the electric field in the capacitor 10 ns after the connections are made. A parallel-plate capacitor has plate area 20 cm2, plate separation 1.0 mm and a dielectric slab of dielectric constant 5.0 filling up the space between the plates. This capacitor is joined to a battery of emf 6.0 V through a 100 kΩ resistor. Find the energy of the capacitor 8.9 μs after the connections are made. A 100 μF capacitor is joined to a 24 V battery through a 1.0 MΩ resistor. Plot qualitative graphs (a) between current and time for the first 10 minutes and (b) between charge and time for the same period. i=24106.1e=5.9×10-8 A(a) The plot between current and time for the first 10 minutes is shown below. (b) The plot between charge and time for the first 10 minutes is shown below. How many time constants will elapse before the current in a charging RC circuit drops to half of its initial value? Answer the same question for a discharging RC circuit. How many time constants will elapse before the charge on a capacitors falls to 0.1% of its maximum value in a discharging RC circuit? How many time constants will elapse before the energy stored in the capacitor reaches half of its equilibrium value in a charging RC circuit? U=12Q2C, where Q is the steady state charge. How many time constants will elapse before the power delivered by a battery drops to half of its maximum value in an RC circuit? 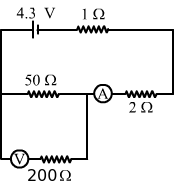 A capacitor of capacitance C is connected to a battery of emf ε at t = 0 through a resistance R. Find the maximum rate at which energy is stored in the capacitor. When does the rate have this maximum value? A capacitor of capacitance 12.0 μF is connected to a battery of emf 6.00 V and internal resistance 1.00 Ω through resistanceless leads. 12.0 μs after the connections are made, what will be (a) the current in the circuit (b) the power delivered by the battery (c) the power dissipated in heat and (d) the rate at which the energy stored in the capacitor is increasing? A capacitance C charged to a potential difference V is discharged by connecting its plates through a resistance R. Find the heat dissipated in one time constant after the connections are made. Do this by calculating ∫ i2R dt and also by finding the decrease in the energy stored in the capacitor. By evaluating ∫ i2Rdt, show that when a capacitor is charged by connecting it to a battery through a resistor, the energy dissipated as heat equals the energy stored in the capacitor. A parallel-plate capacitor is filled with a dielectric material of resistivity ρ and dielectric constant K. The capacitor is charged and disconnected from the charging source. The capacitor is slowly discharged through the dielectric. Show that the time constant of the discharge is independent of all geometrical parameters like the plate area or separation between the plates. Find this time constant. which is independent of the plate area or separation between the plates. Find the charge on each of the capacitors 0.20 ms after the switch S is closed in the figure (32-E34). This is the total charge on both capacitors. As the capacitors are in parallel, the total charge will be shared between them. Also, both the capacitors are of same capacitance; so, they will share equal amount of charge. The switch S shown in figure (32−E35) is kept closed for a long time and is then opened at t = 0. Find the current in the middle 10 Ω resistor at t = 1 ms.
R=1110+110=5 ΩInitially, the switch was closed and the capacitor was getting charged. So, the two resistances were in parallel connection. Hence, their effective resistance will be 5 Ω. A capacitor of capacitance 100 μF is connected across a battery of emf 6 V through a resistance of 20 kΩ for 4 s. The battery is then replaced by a thick wire. What will be the charge on the capacitor 4 s after the battery is disconnected? Q=CE 1-e-t1RCt1RC = 420×103×100×10-6 = 2⇒Q =6×10-4 1-e-2=5.187×10-4 CThis is the amount of charge developed on the capacitor after 4s. Consider the situation shown in figure (32−E36). The switch is closed at t = 0 when the capacitors are uncharged. Find the charge on the capacitor C1 as a function of time t.
A capacitor of capacitance C is given a charge Q. At t = 0, it is connected to an uncharged capacitor of equal capacitance through a resistance R. Find the charge on the second capacitor as a function of time. Let q be the charge on the second capacitor after time t.
According to the principle of conservation of charge, charge on the first capacitor after time t = Q – q. A capacitor of capacitance C is given a charge Q. At t = 0, it is connected to an ideal battery of emf ε through a resistance R. Find the charge on the capacitor at time t.
When the capacitor is connected to a battery, it will charge through the battery. The initial charge will also decay.